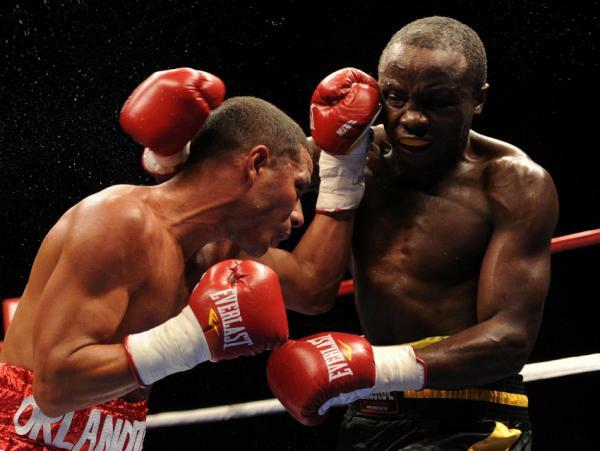 Kenya’s Anthony Napunyi will take on Ugandan professional boxer Ismail ‘Sharp shooter’ Muwendo in a ABO Mid-America title eight-round fight at the Hyatt Regency in Minneapolis, USA on Saturday. Napunyi, was a late inclusion following the withdrawal of Ugandan Wilton Hilario in their earlier bout scheduled for February 9 in what promises to be an enticing East African contest. His father Modest Oduor was a commonwealth boxing champion. The US based boxers who compete in the featherweight category have good personal records which they will be looking to improve by winning the upcoming bout which has been listed as the main event of the day. Muwendo is the defending champion and has 11 wins below his belt, two knockouts and no loss while Napunyi has an equally impressive record having won 14 of his bouts, lost ten and registered seven knockouts. Napunyi has boxed his last seven fight professional boxing career out of Miami, Florida.His most impressive performance as of late was against (22-1) top contender Mason Menard, in which he competitively lost a (10) round decision thus the fight will offer him a good redemption platform. According to the bout organisers there has become a bit of "bad blood" between the two combatants based on comments and unfortunate history between Anthony Napunyi and fellow Ugandan Boxers. Napunyi has stated he is coming to take Ismail's ABO Mid-America Featherweight Title. Furthermore, stating, he's never lost against an Ugandan Boxer, and will not lose against "The Sharp Shooter. Muwendo who is known for accurate lethal punching and powerful displays exuded confidence that he will emerge victorious and extend his unbeaten record. “I’m ready to take on Anthony. I have never lost a fight and I want to promote myself through such fights,”Muwendo told Uganda's Observer. Other fights of the night listed as co-main event will see Jamal James take on Patrick Boozer in the welterweight while Robert Brant will fight it off with Romon Barber. the other bout in this category will pit Brad Herroff against Zach Wolff. In bantamweight, Jonathan Perez will be up against Brian Jones, Tyler Hutin and Steven Watt will be fighting each other as well as Garvin Crout against Tomi Archambault in the last bout on card.